Today's High End vs High Street post is all about detox and pore minimising masks. These types of masks are great if you're like me and have oily - combination skin, they help to unclog pores and help get rid of excess sebum and dirt, thus preventing breakouts and reducing the appearance of open and clogged pores. Both masks are clay based which is the best type of ingredient when dealing with oily skin, the clay helps to draw out impurities and soak up excess oil helping to achieve a even and blemish free complexion. The Ren Invisible Pores Detox Mask is thick and of a more solid consistency, packed with skin clearing ingredients like French Clay to draw out impurities and Essential Fatty Acids to leave the skin smooth and imperfections less visible. The mask is applied to cleansed dry skin and left for 10 minutes or so ( I like to leave to on for as long as possible), it dries hard making the skin feel tight, its then removed leaving the skin looking more refined, smooth and feeling extra clean. 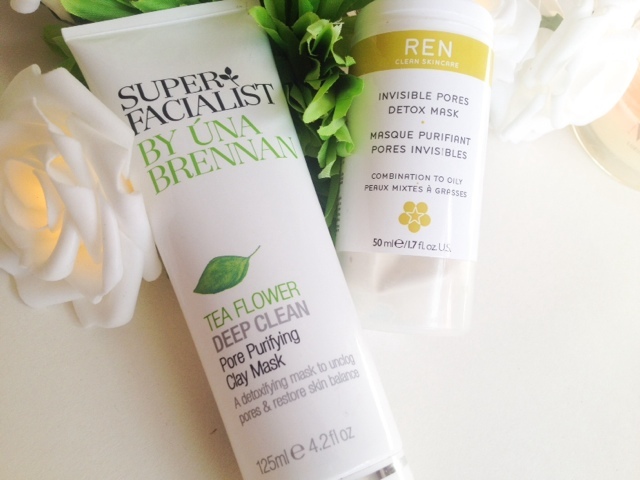 The Una Brennan Pore Purifying Clay Mask is a lot thinner in texture and easier to apply than the Ren mask, still containing some fantastic ingredients like Dead Sea Mud which is renowned for its skin healing properties and oil absorbing abilities. Salicylic Acid that helps to unclog pores and dry up existing blemishes and Vitamins A, E and D which helps restore the skin back to its natural balance revealing a more even and clearer skin tone. The masked are used in exactly the same way and sets hard to the face. Once removed my skin feels soft, more even and clarified, again with a temporary tightening effect to the pores. Which is best? High End of High Street? Both masks work really well and I use them both in rotation weekly as part of my skincare routine. Considering the price difference I expected them to be poles apart but the results they deliver are in fact more or less the same in my opinion. There isn't anything that stands out which would have me say that the High End version is any better than the High Street version. 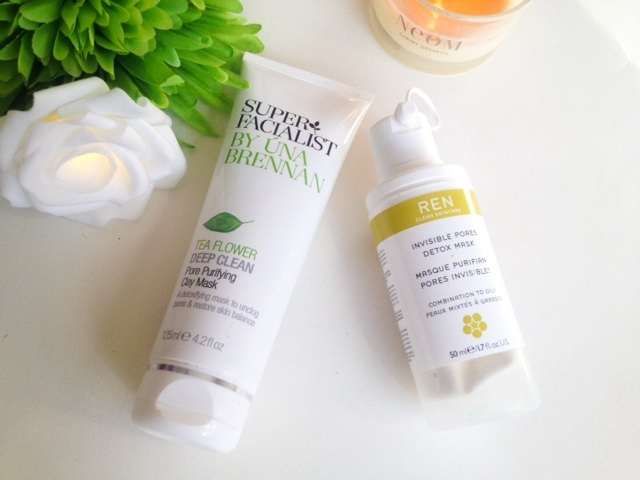 They both smell nice and leave my skin looking and feeling clear, the Ren might offer more of a tightening effect to my pores, but nothing worth spending twice as much money on and remember the result is only temporary. In my opinion I think the high street wins here, the Una Brennan range is fantastic value for money and offers a wide range of products to suit all skin types and concerns. When my Ren Mask runs out I will definitely not be repurchasing and sticking to the High Street version. What are your recommendations for clay Masks? Have you tried these two, what did you think of them? I've not tried either of these and I've had the REN one on ,y wish list for a while but I can't bring myself to part with the cash. I might try the Una Brennan one first! Thanks for this! I have been looking to try the Una Brennan mask for ages. I'll have to take a look for it in Boots today! That's actually pretty good that these worked well! I honestly usually find that more expensive masks work better for my skin.